The University of Georgia uses hype videos to stir anticipation for the University of Georgia’s football games. The videos gain several thousands of views online and on the jumbotron of Sanford Stadium. The production quality may rival that of Hollywood, but the man behind the videos is a college student. Frank Martin’s camera and editing skills are self-taught. 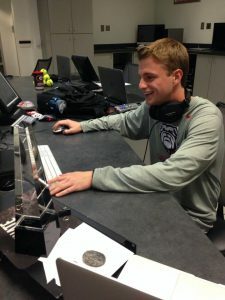 The Univeristy of Georgia submitted Martin’s video “Letter to Larry”, a tribute to the late UGA football announcer Larry Munson, to the International Design Excellence Awards. There, it won “Best Tribute Video” over professional league videos. His videos give me chills…amazing raw talent….keep ’em coming……..and GO DAWGS!!!!! Sic ’em!!! You’re right. He really is.